The Tour Soleil Ski Tour is a brilliant and varied week, starting and finishing in Switzerland, but travelling into the Italian Formazza Valley – home to the Walser people. Reliable snow and good weather, combine with small friendly huts and non of the crowds of the better known areas. Most days it’s not unusual to have a classic peak or great descent all to yourself. Really enjoyed the trip. Neil was a great guide, and appreciated the prompt responses and clear information from Alpine Guides. Would definitely do a trip with you guys again. This is an excellent quiet touring area with plenty of accessible ski summits and good varied descents, on both powder and spring snow. Their are several ways to traverse through the range, linking up the hut system. We may do the tour West to East as described, or the other way round depending on snow conditions – two nights are spent in a couple of the huts, allowing us to enjoy skiing with a lighter pack on. Need further information? enquire about this trip. This is an intermediate level trip. To take part you should be at Fitness Level 3 and Tech Level 3 (see our Fitness/Experience guidelines). You need previous multiday ski touring experience in order to join this tour. The week includes 6-8 hour days and some long climbs, so you can expect to be skinning for 3-5 hours a day. Type of ascent: we use 100% skinning on the tour – approx 5500m of skinning up, 5800m of skiing down. One UIAGM guide skiing with 6 clients. This trip is protected against financial failure through our membership of the Association of Bonded Travel Organisers Trust (ABTOT) – Alpine Guides Ltd, Membership Number 5394. For further information, please visit our Financial Protection page. Our meeting point for this trip is the comfortable Hotel Europe*** in Brig, which is just 80m from the railway station in the centre of town. Rooms are provided on a twin (or occasionally triple or quad) sharing basis, but if you wish to book a single room please let us know and we will confirm availability. Any extra luggage can be left until in the hotel until your return to resort at the end of the week. Evening meals can be taken in Brig. Hotel details can be found on our Accommodation page. For overnights in the high mountains we will use mountain huts. For more info please read the Using Alpine Huts article which provides an overview of typical facilities, average costs to help you budget for lunches/drinks, and general info on hut etiquette. You should arrange outward travel on Saturday, arriving by 6-7pm latest in time for the briefing at your accommodation. Your guide will run through kit checks and safety routines, as well as hand out any rental equipment, before going on to discuss the current weather and mountain conditions and how these affect our plans. We’ll have maps and guidebooks of the area to show you, so if you’ve any further questions or last minute requests, then this is the ideal time to bring them up. Overnight in the valley. Early train to Feisch, from where we skin up the Binn Tal to the unmanned Binntal Hut. Inaccessible and hidden away in the back of beyond, the Binntal has a remote ‘lost world’ feel to it – and by the time you reach the hut after four hours march, you really do feel in the middle of nowhere! The hut is comfortable and fully equipped – we just need to carry some food in. Wine and beer can be purchased from the hut supplies using an honesty box, so it makes for a great spot to spend the night. There are several different ways of reaching the Margaroli Hut in Italy, from the Binntal in Switzerland – so this is a day that can be varied depending on conditions and the fitness of the party. All involve crossing one or two cols in order to pick up good descents on either north facing powder, or south facing spring snow. The Hut itself lies next to Lago Vannino – depending on the route taken, we may have to skate or skin across the lake in order to reach it. Like most italian huts, there’s a good bar and a friendly welcome awaiting. 600-1100m ascent and descent, depending on route taken ~4-6hrs. 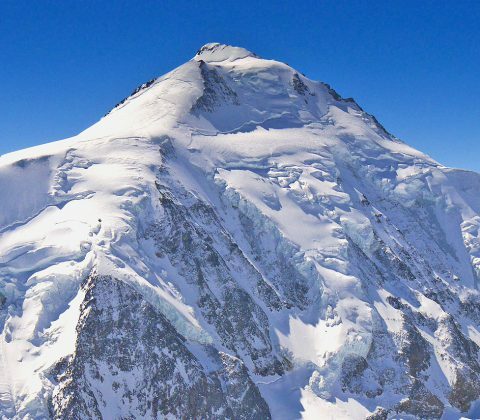 Like many peaks in the area, the Offenhorn has two names: one Swiss and one Italian (Punta D’Arbola). 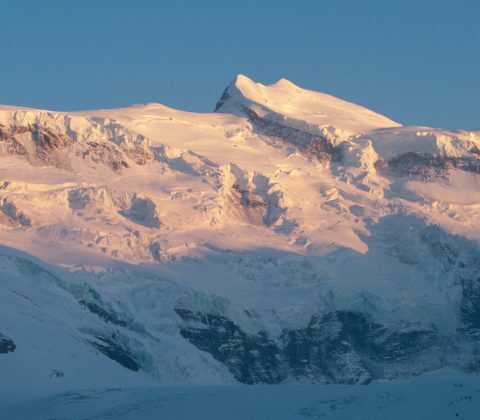 Either way, it’s a classic ski peak of the region – with extensive views east to the Monta Rosa chain. Depending on conditions, a choice of descents is possible – if there is powder around, the north facing descent down the Sabbione Glacier is excellent, or if spring snow conditions are better, then the SE facing descent down to Lago Vannino is also a superb choice. In the latter case, the route back to the Margaroli Hut involves skating across the lake over the ice – if the lake is snow covered, then it’s half an hours skinning instead! 1100m ascent and descent ~5-6hrs. The day starts with an hours climb up to the Passo di Nefelgiu, which gives access to a long north facing descent finishing at the tiny hamlet of Riale, which is the highest village in Val Formazza and a good example of the distinctive local architecture of the region. There’s also a café and bar here, so it’s a good opportunity to enjoy a mid morning break and soak up the beautiful surroundings. In the afternoon, we skin up a long, snowy track on the far side of the valley to the Maria Luisa Hut. Having an uphill finish makes this day feel pretty hard, but there’s hot showers and a good bar at the hut to aid recovery! There are numerous good day tours all around the Maria Luisa Hut, allowing us to spend a day skiing here with lighter packs on. To the north of the hut, the Rotentalhorn offers a good viewpoint and a great ski back down again, usually on spring snow. To the east there are a number of options, including a circular tour of the cols north of Basodino. Stable conditions are required here, as there are a number of sections on steeper terrain, but the tour finishes with a superb descent down the long, broad couloir dropping off the Kastellucke. Our final choice will depend on current snow and weather conditions. Skiing down into the Upper Rhone Valley near Munster is one of our favourite ways to finish the Tour Soleil. An early start and careful assessment of conditions are required, as the various descent routes all pass through steep sided valleys in order to reach the train line down in the main valley. The reward is a long north facing descent that’s not often skied, so usually there are plenty of fresh tracks to be had. Back in the valley, there’s time to enjoy a lunch time drink before hopping on the train back to Brig to finish the week. Return travel should be arranged on Saturday morning, after your final nights accommodation. Your course starts and finishes in Brig in the Rhone Valley, with easy access and good links to the Bernese Oberland, Valais Alps and the SE Swiss Alpine chain. The most convenient way to reach Brig is fly into Geneva, then take a train along the Rhone Valley – Brig is on the main railway line, and our hotel is a short walk from the train station. Fly to Geneva with numerous budget airlines, for an overview of the best options check out the excellent Sky Scanner website. If you plan to arrive by train, then purchasing a Swiss Travel Pass (details on website above) could save you some money on this course, as you get half fare on the cable cars in many resorts, as well as on the trains and buses. If you purchase a Swiss card the journey from the airport to Brig and back will be included. Alternatively hire a car at any airport (all 2-4 hours driving time). Driving from UK, take the ferry or Eurotunnel to Calais/Dunkerque, then 10-11 hours driving. Further information and travel links can be found on our Travel Planning page. If you need to top up your fitness for this trip, please see our training guidelines. Our Advice: Definitely go on an Off Piste Skiing Course to improve your ski technique first, before trying ski touring – you’ll get a lot more out of it that way around! Our Advice: An Off Piste Skiing Course is highly recommended. If you’d like to try ski touring, then do either an intro ski touring course or an intro level ski tour. Our Advice: Off piste coaching still useful. Intermediate off piste weeks are at your level too. If you want to get into ski touring, try a touring course or intro level ski tour. If you’re an established ski mountaineer, then intermediate level tours are generally suitable. Likely to say: I’ve been skiing ten/twenty years – I’d like to do your ‘……’ tour. Our Advice: You will enjoy our advanced level trips. If you are new to touring – then you could do a Haute Route with two or three days of skills training beforehand (but don’t overlook the physical fitness needed as well). Mileage is the best way to improve your ability level. Our Advice: Stay strong – and may the force be with you… Advanced level trips and ski expeditions are the way forward. Please make a self assessment against these levels, and refer to the trip requirements. These are cardiovascular (CV) fitness and activity levels eg. running, cycling, hillwalking or competitive sports that get your heart and lungs working for extended periods of time (not strength training in the gym!). They include mountaineering fitness and ski fitness benchmarks for context. You do 1-2 hours of cardiovascular training/sport per week. On foot: you should be able to climb Snowdon from Pen y Pas in around 2 hrs carrying a day sack, or Bow Fell starting from Langdale in the Lake District in about 2 1/2 hrs. On skis: you are happy piste skiing all day with just the odd break for food and drink, but would struggle to ski off piste all day without finishing up very tired for the following day. You do 2-3 hours cv training/sport per week. At this level you should be happy doing either a 3-4 hr hillwalk, cycling 30 miles or mountain biking 2-3 hours without being exhausted. On foot: you should be able to walk from Ogwen Cottage in North Wales up Glyder Fach – Glyder Fawr – Y Garn – Ogwen in ~5hrs. Or in the Lake District Langdale – Bowfell – Esk Pike – Angle Tarn – Langdale in ~ 6hrs. On skis: you are capable of off piste skiing all day or doing a couple of hours skinning with out finishing up exhausted – ie you can do this for a number of days without taking a rest day. You do 3-4 hours cv training/sport per week. At this level you are happy doing a 5-6 hr hillwalk, 50ml cycle or 3-4hr mountain bike ride without being totally exhausted. If you are into challenges – then the thought of doing a road sportive, or training to do a 1/2 (or maybe even a full) marathon, wouldn’t seem too ridiculous. On foot: you should be able to do the full Langdale Horseshoe: Langdale – Pike of Stickle – Angle Tarn – Bow Fell – Crinkle Crags – Pike of Blisco – Langdale in a day without finishing up exhausted. On skis: you can skin uphill at 300m/hr for 3-4 hrs a day (ie 8-1200m of ascent each day). You do 4+ hours CV training/sport per week. A 70+ mile cycle ride, or 20+ mile hillwalk on a weekend would hold no fears. If so inclined, you might be the kind of person who has done longer road sportives/challenge rides, a ~3.30hr marathon or other similar endurance events. Keen hillwalkers who happily knock off 3-4+ munros in a day also have this kind of fitness and endurance. On skis: you can skin at 400m/hr or could handle 4-6hrs skinning a day. (ie 1000-1400m+ of ascent each day). You do 5-6+ hours training for competitive sport per week, have a background in the same, or you are annoyingly talented! Either way, doing a 100 ml bike ride or about a 3hr marathon wouldn’t be unreasonable. On skis: you are happy skinning at over 400m/hr or could skin all day if neccesary (ie 1400m+ days). Please be realistic in your assessment, and remember you need both the required fitness level and ski ability level in order to enjoy any given trip – it doesn’t matter how fit you are, if you can’t ski well enough you won’t keep up on the descents – and vica versa on the ascents! If your fitness or skills are in doubt there is a risk you could be excluded from an activity or required to leave the tour, if your participation could risk the safety, success or enjoyment of the rest of the party. Just remember, every extra kilo on your back knocks 10% off your enjoyment on the descents – so try and keep the weight down! Your guide will have all other safety kit, first aid and survival equipment. Visit the Knowledge Base section of our website, where we publish an annual review of the years best new skis, boots and touring equipment, plus a range of other interesting tips and recommendations. If you can’t find what you’re looking for, please get in touch! Backcountry UK in Ilkley offer an excellent ski boot fitting service, one of the best ranges of ski mountaineering equipment in the UK and top notch advice. Please visit our Equipment Hire page for recommended hire shops in your resort, and Alpine Guides hire equipment price list (safety equipment is provided free of charge on certain courses – please consult price inclusions). For this trip you must have specialist travel insurance providing medical, emergency search/rescue and repatriation cover for the following activities: off piste skiing and ski touring in glaciated areas requiring the use of ropes, up to 5000m altitude. We also strongly recommend that you purchase cancellation cover, in case you’re unable to attend your trip due to personal circumstances or injury. Please arrange your insurance as soon as your trip is confirmed to run. British Mountaineering Council. The gold standard in insurance for UK residents. Very competitive single trip or annual cover for all climbing activities. Use this link to book your BMC insurance. European Health Insurance Card (EHIC). This gives you reciprocal health care in European countries. You can apply for an EHIC card online here or from most Post Offices. You need an EHIC in addition to your travel insurance. Austrian Alpine Club. Available to all European residents. AAC insurance is cheap and works ok for minor accidents and rescues, but is not as comprehensive as many other insurance providers. The medical cover included would not be enough for complex treatment or a prolonged stay in hospital. It also doesn’t include cancellation cover. If you choose to use AAC we recommend you take out extra medical cover with another provider, to ‘top up’ the AAC medical limit, as well as a separate cancellation policy. Travelex. For US citizens – a range of policies with comprehensive cover. Global Rescue. Cover offered to all nationalities via a combination of GR membership and their separate insurance policy. If you choose an alternative provider, or if there is any doubt about the scope of your chosen policy we recommend that you send your insurer the link to the relevant Alpine Guides trip webpage, and ask them if cover extends to those activities and has the required components (search/rescue, medical, repatriation and cancellation). It’s worth mentioning that rescue and medical expenses in Switzerland can be significantly more expensive than in other countries, so a decent level of cover is required for Swiss tours. We recommend that you send us your insurance details before the trip commences, and they must be brought to the course briefing at the start of your trip. However, we cannot check the detail of every individual policy, and it is your own responsibility to ensure you are adequately insured. What happens to my deposit if I book a trip, but it isn’t confirmed to run due to insufficient bookings? You may transfer your booking to different dates, a different course, or choose a full refund. 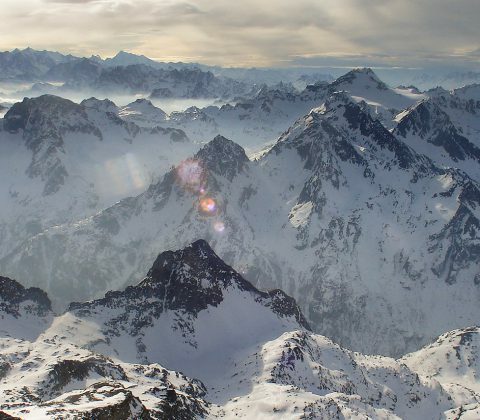 What happens if the weather or snow conditions are poor, or the avalanche risk is high? We will make every effort to stick to the itinerary, but sometimes its necessary to change plans and ski in a neighbouring area or even further afield. Many of our itineraries are designed with flexibility in mind, and it’s usually possible to ski in most conditions with some careful alternative planning. What happens about accommodation, if the weather is very poor and we end up spending extra nights in the valley instead of in huts? We will make any necessary last minute bookings for the team. On trips taking place outside the Chamonix valley, any extra valley hotel nights will be on a BnB basis rather than half board. Does Alpine Guides ski with customers from overseas, including the USA and Canada? Who goes on our trips? We climb and ski with a broad range of ages and experience levels, and a large number of our customers come back year after year. We’ve guided 10 year old Ollie up the Old Man of Hoy in Scotland – now the youngest person to climb it. And 70 year old David has climbed the Matterhorn with us, as well as out-skiing people half his age! How do I book a ski trip? For scheduled ski trips it’s easy to book online, directly from your course page. For hire a guide/bespoke courses please get in touch for a quote. Is there an age limit on any of our ski trips? Under 18’s must be accompanied by a parent/legal guardian. There is no upper age limit, but please get in touch to discuss suitability if you are concerned about your age, with regard to fitness and pace. How do I rent ski equipment? You can rent certain items of specialist equipment from us, and the rest can usually be hired in resort. More than 8 weeks (56 days) before start date – loss of deposit. Between 4 and 8 weeks (28-56 days) before start date – 50% of course fee or loss of deposit, whichever amount is greater. Less than 4 weeks (28 days) before start date – full course fee. Can I book a single room on my ski trip? Yes – this can be done during the online booking process. Please add the single room option to your order, and we will confirm availability asap. Please enter a valid email address. Click or tap this notice to hide. © 2019 Alpine Guides. All rights reserved.